When the west opened for expansion, thousands of people set forth with their families in order to make a better life for themselves. When they arrived at their destination and began to work the land, open their businesses, and develop communities, they found that there was a need for education even in the “wild west.” Those intrepid pioneers wanted a better life for their children and they were very intent on seeing that their children were properly educated, even if they lived dozens of miles away from a town or school. It was with westward expansion that America began a new tradition in education. Known as a one-room school house, these educational institutions dotted the American countryside and educated generations of students. They were supported by the families of the area and they hired hundreds of teachers who too had come to the west to seek a better life. As these western towns grew, dedicated townspeople sold bonds and raised money to build larger schools so that the betterment of their children’s education could continue. These larger schools were often made of brick and built by local builders who had to outbid one another. When bids were awarded construction began and what resulted were resolute buildings that have educated generation upon generation of students. This is where our story begins, the story of The Orient School. The Orient School stands like a sentinel and guard over the tiny hamlet of Orient. It has stood the test of time for a century and has never closed its doors to the children of the area. It is an institution of learning, of community activity, and a place where children know they are safe. The story of The Orient School is one of survival. It has survived industrial failure and economic depressions, decreasing populations, and threats of closure, yet the spirit of the school lives on. Its intrepid faculty, caring community, and eager students continue its legacy and after 100 years those who have attended the school revere it as if it were a living breathing entity. No one knows exactly what was said in that meeting, except that a decision to move forward was made, for one week later the following appeared in the Kettle River Journal. “Notice is hereby given that in accordance with section 201 of the Code of Public Instruction of the state of Washington, on the 21st of June at 10 o’clock in the forenoon of the said day, at the office of the County Treasurer of Ferry county, in the city of Republic, Washington, the directors of School District No. 11 of said county and state, will consider proposals for the purchase of bonds of said school district. “Sealed bids will be received by the clerk of School District No. 11 Ferry County, Washington, whose post office address is Orient, Was, up to 5 o’clock p. m. June 25, 1910, for the construction of a two-story brick building with basement. Plans and specifications on file at the office of said clerk. Each bidder shall deposit with his bid a certified check equal to 5 percent of its amount, and should the bidder to whom the contract is awarded fail to enter into a contract with the board of directors of said school district within seven days after the notice of such award, the amount of said check shall be forfeited to the general school fund of the district. The right is reserved to reject any or all bids.” (Alex Anderson, The Kettle River Journal, July 1910. By July 2, 1910 the decision had been made and the following ran in The Kettle River Journal. The new Orient School was indeed the pride of the town and the envy of all neighboring towns, students who started that day in 1910, had the unique experience of sitting at a new desk and engaging in what promised to be an amazing educational experience for all who attended The Orient School. Discipline was strict and a student was expected to follow the rules. Daily lessons were taught by a variety of methods and subjects included: reading, grammar, mathematics, history, writing, science, music, and art. Students were encouraged to study hard and succeed. 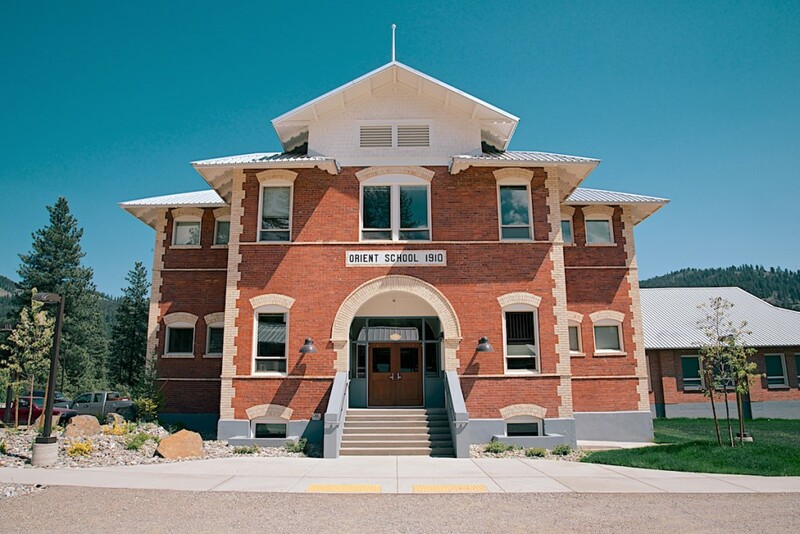 By 1912, The Orient School had made a name for itself by holding concerts, debate tournaments, and a variety of other programs that entertained the community. Students rehearsed in the basement. Every year, the students participated in a holiday program, a tradition that continues to this day. When the First Thought Mine closed down in 1912, it was a shattering economic blow to the Town of Orient. It is here where we see the first inkling of the importance The Orient School played in keeping the community connected. As the ore and gold deposits continued to dry up, more businesses failed and by August 1913, Alex Anderson and his paper relocated to Republic. During this time, it was the school that became the fountain of information and a rest for people from the economic storm. People could go there and forget their troubles while being entertained by students who were very talented in putting on plays and giving concerts. As the school neared its first decade of operation, the population of the school declined as families left to look for work. However, as the school absorbed neighboring districts due to budget constraints and improvements in transportation, the school population steadied. Families that had ranches, lumber mills, and prosperous farms found the area still economically viable and their presence and support of the school was phenomenal. By the 1930’s, Orient was taking a progressive approach towards education and encouraging students to try many things. One of the results was The Orient Broadcast, which was a yearbook. The 1938 edition gives us a glimpse into the lives of the students at this time. They were dreamers, poets, but above all students who cared deeply about their “red brick schoolhouse”. They had senior sneak days, baseball teams, choirs, a school paper, and a dramatic society. In 1938, a school bond was passed to allot $10,500 along with support from the Works Progress Administration (WPA) for another $13,500 to build a gym, modernize the electrical system, add steam heating, and create some additional programs. The WPA supervised the building and the new amenities were a welcome addition to the school which would now be able to expand their ability to entertain their community and above all educate its students. 1939 marked the last high school class to graduate from Orient and the school has since then taught students through the eighth grade. Throughout the next several decades, teachers faithfully taught their students molding them into respectful young adults. The school focused on a variety of programs geared to educating and caring for their student population. Students of that time remember engaging in a variety of sports, artistic endeavors, and developing friendships that have lasted a lifetime. Some of the families have had as many as four generations pass through the halls of The Orient School. When my family came to Kelly Hill in 1982, we built our own house, hauled water, and did not have electricity. In many ways it was like being a modern pioneer. During this time, it was The Orient School that was my saving grace. It was here that I learned to love books and history. The teachers there were the most amazing people I have ever met. I knew that when I came to school that I would be well cared for, nurtured, and leave a better person at the end of each day. It was the school each day that made sure my sister and I had a good meal, even if they made us eat stewed tomatoes, Yuck! At this time, the student population of the school was around 120, the younger kids Kindergarten to 4th were on the bottom floor and 5th through 8th were on the top floor. The younger kids hardly dared to go upstairs as it was a forbidden zone and the big kids ruled. It is funny, but even now I do not go up there. During that time it was evident that the school was a community center as well. There were movies every Friday night with popcorn and I do not know how they did it, but the school managed to get new movies to show! It was here that I watched The Karate Kid and Footloose. It was here that I had my first stage debut in the annual holiday program and it was here that I always felt safe and secure no matter what was going on in the outside world. The care of the faculty and staff was evident at the time as well. In a newsletter that I have carefully tucked away is a small article about Hazel Graeber, she was a secretary at the school when I was there. In this article, a kindergartner asks his mother if she has ever hugged Hazel, when the mother answer no, the child tells her next time to give her a hug. I remember Hazel and her famous hugs; they always made you feel better. I also remember Nancy Kent, she had a nick name for me, and it was Henna after Henny Penny in Chicken Little, because I was always so dramatic. Most of all I remember my 3rd and 4th grade teacher Mrs. Miller. She was never afraid to give us a hug, but she also made sure that we did what we were told. Years later when I went back to visit the school and tell her what I was doing in life, she told me a story that I had forgotten. She told me that the day I found out that I had to move away I came to her sobbing and asking if she would keep me because I did not want to leave. She told me as she was telling the story that had there been a way she would have kept me. As I sit here and think about the fond memories I have of The Orient School, I realize how lucky we all are to be alumni of such an amazing school. We have walked the halls, laughed in the play yard, and perhaps have even waved as we drove away. Over the years, many people have stopped at the school to state that they attended or a family member attended, and never once have I heard them say anything negative. What an endeavor to be a hundred! Think of the many secrets these walls hold and the stories they could tell. How fortunate that we attended The Orient School and had an education that prepared us to be caring and hardworking individuals. Truly, The Orient School has helped many generations see the potential in themselves. Surely, one can agree that The Orient School is a place worthy of centennial recognition. May The Orient School forever be a place where children develop fond memories, get an excellent education, and leave with the knowledge that they can do anything. This brief history is dedicated to The Orient School which is celebrating its 100th year in operation. This history was compiled during several months of research. The author would like to thank The Orient Centennial Committee, The Orient School, The Kettle Falls Public Library, The Museum of Arts and Culture, and The Eastern Washington Regional Archives. Personal thanks to Ted and Cathy Burley, Ruth Lakin, Dayna Cooper, George Farwell, Austin Farwell, My Family and Friends. A special thanks to my grandfather Ray Hussey who gave me the idea to write about Orient in the first place. Jen Hussey has her Master of Arts in History and a Master of Public Administration from Eastern Washington University. She has published several articles and had her own monthly column in the West Central Community News. She is a member of the West Central Neighborhood Council and enjoys volunteering her time. She lives in a 110 year old home in Spokane with her two happy cats Bailey and Clara. She is always interested in doing historical projects and is available via e-mail at jlmhussey2000@yahoo.com or by phone at 425-760-5708.